Quick Note: If you're just learning about Sweater Club or need a review, jump over here for more information. Nothing says summer more than a breezy shawl collar cardigan with a few wow-factor stripes. Ronin is worked in pieces from the bottom up in minimal stockinette fabric with beautiful shaping details. The main fabric is Fern held single, but the stripes are worked with Fern and Silk Cloud held double for a subtle change in texture and little extra luxury. A simple boxy pullover with a few thoughtful details, Solis is the summer sweater you will reach for time after time. The pattern is written for Fern held single or Fern and Silk Cloud held double (shown above), depending on the fabric you wish you create. The front and back pieces are worked from the bottom up, and the sleeves are picked up across the armholes so you can easily adjust the length to suit your personal taste. Shibui Knits creates some of my favorite yarns to work with. 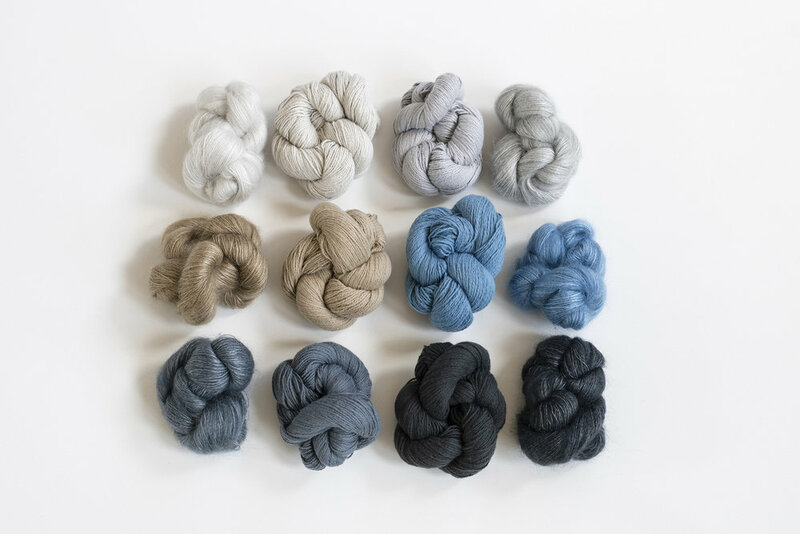 Their newest yarn, Fern, is a fantastic cotton yarn that is brushed to luxurious perfection. Knit alone or paired with Silk Cloud, both fabrics offer the wearer a very special garment that will drape gorgeously. Colors shown: Bone, Ash, Caffeine, Shore, Graphite, and Tar. Just for fun, you can add some amazing light-weight linen fabric and a sewing pattern to your kit. Many months ago, I was visiting Chicago and met up with Jen Beeman (Grainline Studio). We've both been serious fans of one another's work for years, so it seemed totally right to make and style one of her lovely tops with the Ronin cardigan (shown above). During that trip we hatched the plan to include the fabric and The Hadley top pattern as a fun (and totally optional) add-on to this Sweater Club. Note: The fabric is 100% handkerchief linen. Colors shown: Natural, Blush, Charcoal, and Curry.